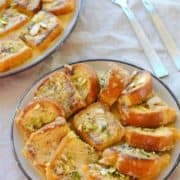 A decadent bread pudding, Shahi Tukray is made of fried bread slices dipped in sugar syrup, then soaked in milk and finally topped with nuts and cardamom powder. Simply heavenly! Spread a generous amount of butter on both sides of the bread slices and cut each slice into four pieces. Arrange the buttered bread slices in a frypan and shallow fry until golden brown. Flip and repeat. Set aside. Heat the sugar and water and cook for 10 -12 minutes on medium heat until the solution thickens and turns syrupy. Mix the milk and cream in a sauce pan. Add food colour. Bring to a boil and lower the heat. Cook on low flame for 20 minutes, until the milk thickens, stirring it a few times in between. Turn off the heat and add the kewra water. Now, dip the bread slices in the sugar syrup and let them soak for 2-3 minutes. Then, dip them in the thickened milk and again let them soak for a couple of minutes. Remove the bread slices from the milk and arrange them on a platter. If there is any remaining milk, pour this on the bread. Sprinkle the powdered cardamom and slivered nuts on top and serve warm. If you’d like to save some time, don’t start with frying the bread pieces first. Get the sugar syrup and milk going first. Then, as these are cooking, butter and fry the bread slices in the meantime. Shahi tukray tastes great cold too. If you prefer a chilled dessert, keep the platter in the refrigerator for an hour or two and then serve. Kewra water is an extract of pandanus flowers. A clear, fragrant liquid, it is very similar to rose water, and is used for flavouring desserts and biryanis in North Indian cuisine. It is readily available in Indian grocery stores.